Samvedna, as the word suggests is a humble effort to leverage the power of Information and Communication Technology - ICT - to create a more humane, compassionate and understanding world. A crying need of the hour as all would agree. We thought the best way to do this is to work through the grassroots - schools - to be precise. 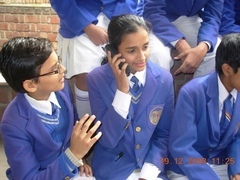 Samvedna connects school children across the nation in an effort to develop a mutual appreciation society where each individual 'reaches out' to the world to make it a better place to live. This objective is being achieved by engaging children, their parents & teachers, college volunteers and corporate executives in meaningful projects. 8. Samvedna is delivered through teacher training workshops - online as well as in schools. Students too are welcomed to be part of these sessions.